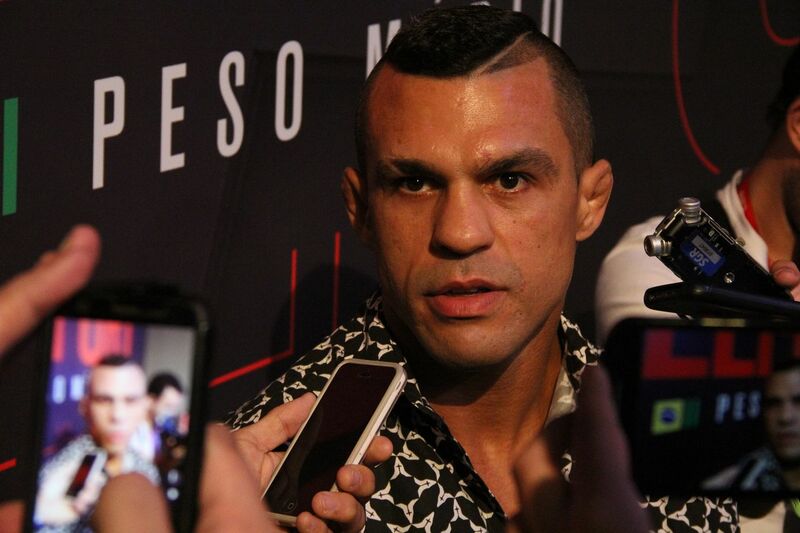 “The Phenom” recently said he will “continue competing” after the last bout of his contract with the UFC, his upcoming clash with Nate Marquardt on June 3 in Rio de Janeiro. His manager Gustavo Lacerda has some options in mind for the Brazilian. Lacerda told MMA Ganhador podcast that Belfort wasn’t so excited anymore about fighting in the past, but “he lit up his fire again,” and that explains his change of heart about retirement. According to the manager, several promotions reached out to Belfort’s team during his UFC run, asking how long his contract with the company was. Days away from becoming a free agent, “The Phenom’s” team revealed interest in fights with two fighters who are currently under contract with Bellator. Wanderlei Silva and Chael Sonnen are set to headline Bellator’s upcoming event at New York’s Madison Square Garden on June 24. Belfort, who knocked out “The Axe Murderer” in 44 seconds in UFC’s first trip to Brazil in 1998, was scheduled to face both fighters in the Octagon in the past few years. However, both fights fell apart when Belfort broke his hard prior to his rematch with Silva in 2012, and Sonnen failed a drug test in 2014.